The holiday season is sneaking up, isn't it? Thanksgiving is next week, so it's starting to feel ok. My first sighting of the big Sinful Colors holiday endcap at Walgreens was back before Halloween, but I wasn't ready yet. I'm still not quite there really...but here we go anyway! Like last year, Walgreens got a BIG endcap and Rite Aid has several shelf displays. They overlap, but aren't completely the same. This isn't everything that you'll find in them, but still a pretty good representation. There are three new shades at Walgreens, two of which are also at Rite Aid. Outta Space is a Walgreens exclusive, it seems. 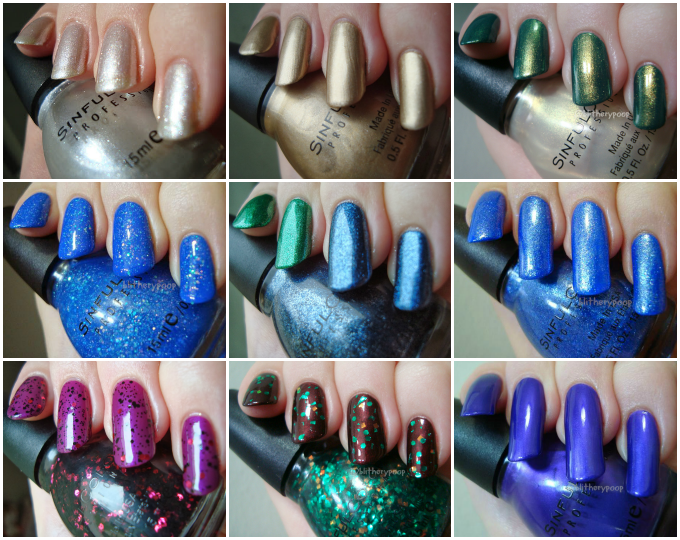 I passed on Twilight Twinkles, a mix of gold shards and gold holo bar glitter, but I got the other two. Galax-Sea has orange squares and green shards and hexes in a clear base. Shards are a thing again this year, it seems. While I liked two of the three Halloween mixes, I can't really get behind Galax-Sea. 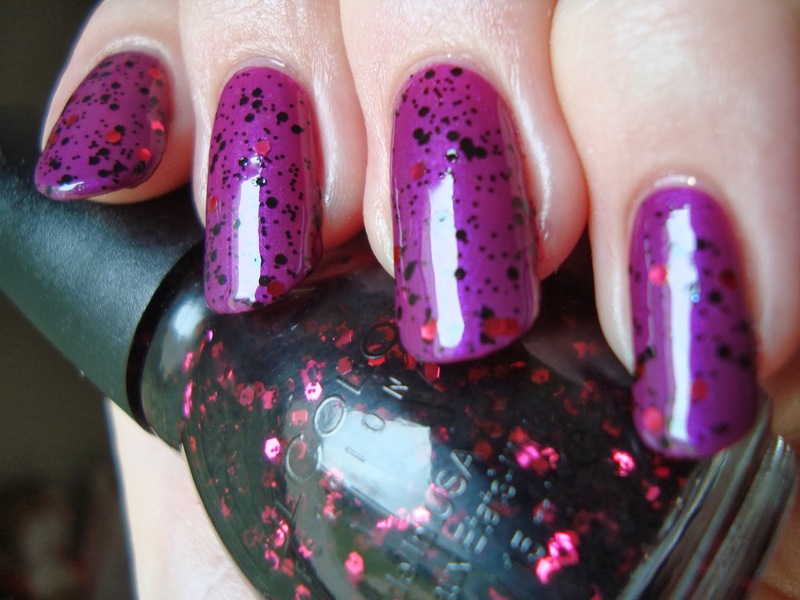 The base is watery, which makes it hard to catch the glitter. It doesn't apply evenly either. It took a lot of dabbing and placing to get it to look even. 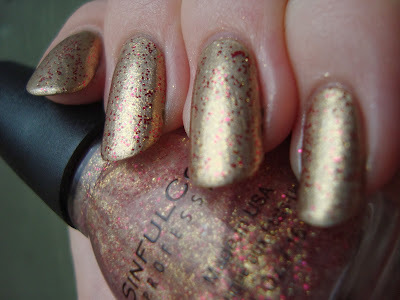 Outta Space has dense golden shimmer with a slight blue-green shift in a clear base. I was a little worried about how Outta Space would layer, but I wound up pleasantly surprised! Though it looks worryingly frosty in the bottle, it went on evenly without streaking or brushstrokes. 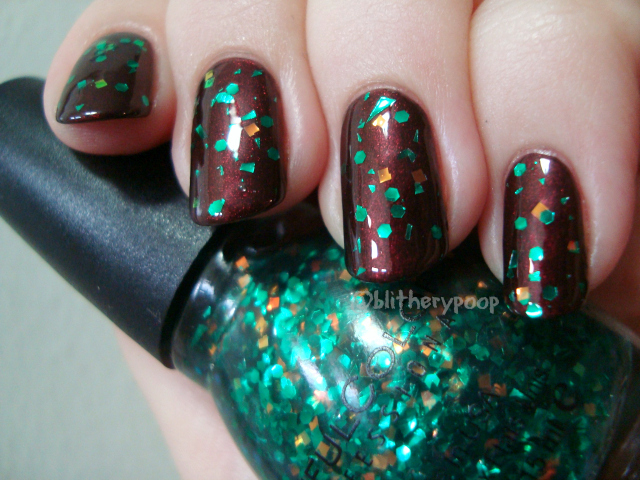 This is one coat over Milani Enchanted Emerald. When the light catches it, it glows like the photo above, but even in less direct light it avoids frostiness. Now for a whole bunch of reruns. Some of these swatches are embarrassingly ancient. 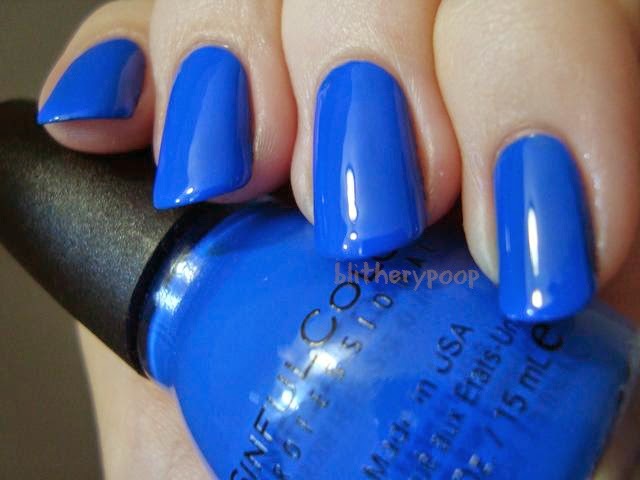 Click the shade names to read my previous reviews. 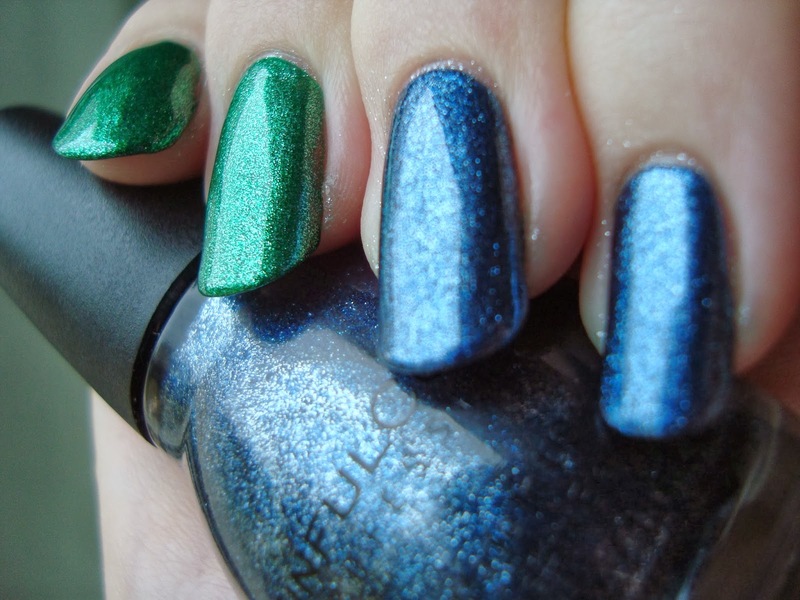 Bottom line: Outta Space is a good topper, but Galax-Sea is watery and hard to work with. As the repromotes go, the only one I don't like is Gold Medal....though I hear it stamps well. I might be adding more "reruns" to this post, since I forgot to make notes the last time I saw the display. I'm fairly sure I saw one of the Opalescent Toppers in the Walgreens display, for starters. Thanks! I thought it might be. 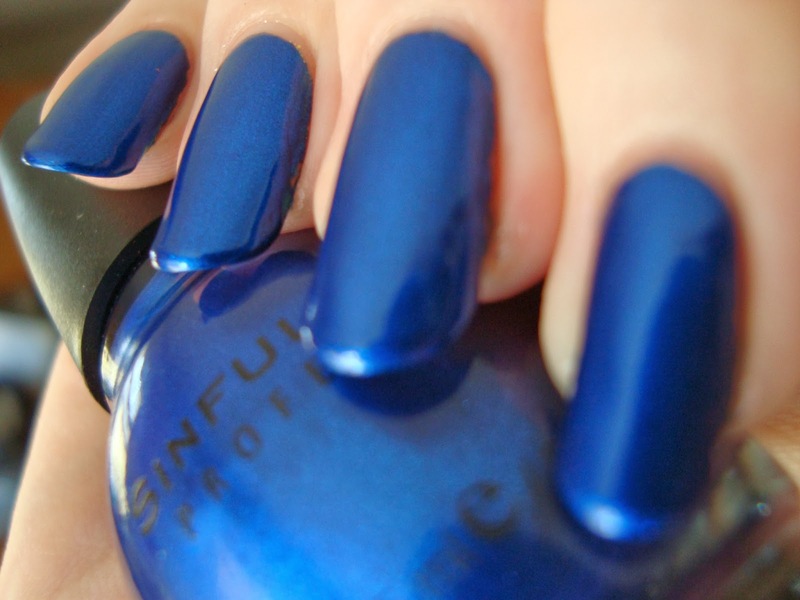 I'm completely in love with endless blue!